For other uses, see Memoir (disambiguation). Look up memoir in Wiktionary, the free dictionary. A memoir (US: /ˈmemwɑːr/; from French: mémoire: memoria, meaning memory or reminiscence) is a collection of memories that an individual writes about moments or events, both public or private, that took place in the subject's life. The assertions made in the work are understood to be factual. While memoir has historically been defined as a subcategory of biography or autobiography since the late 20th century, the genre is differentiated in form, presenting a narrowed focus. A biography or autobiography tells the story "of a life", while a memoir often tells a story "from a life", such as touchstone events and turning points from the author's life. The author of a memoir may be referred to as a memoirist or a memorialist. Memoirs have been written since the ancient times, as shown by Julius Caesar's Commentarii de Bello Gallico, also known as Commentaries on the Gallic Wars. In the work, Caesar describes the battles that took place during the nine years that he spent fighting local armies in the Gallic Wars. His second memoir, Commentarii de Bello Civili (or Commentaries on the Civil War) is an account of the events that took place between 49 and 48 BC in the civil war against Gnaeus Pompeius and the Senate. The noted Libanius, teacher of rhetoric who lived between an estimated 314 and 394 AD, framed his life memoir as one of his literary orations, which were written to be read aloud in the privacy of his study. This kind of memoir refers to the idea in ancient Greece and Rome, that memoirs were like "memos", or pieces of unfinished and unpublished writing, which a writer might use as a memory aid to make a more finished document later on. The Sarashina Nikki is an example of an early Japanese memoir, written in the Heian period. A genre of book writing, Nikki Bungaku, emerged during this time. In the Middle Ages, Geoffrey of Villehardouin, Jean de Joinville, and Philippe de Commines wrote memoirs, while the genre was represented toward the end of the Renaissance, through the works of Blaise de Montluc and Margaret of Valois, that she was the first woman to write her Memoirs in modern-style. Until the Age of Enlightenment encompassing the 17th and 18th centuries, works of memoir were written by Anthony Ashley-Cooper, 1st Earl of Shaftesbury; François de La Rochefoucauld, Prince de Marcillac of France; and Louis de Rouvroy, duc de Saint-Simon, who wrote Memoirs at his family's home at the castle of La Ferté-Vidame. While Saint-Simon was considered a writer possessing a high level of skill for narrative and character development, it wasn't until well after his death that his work as a memoirist was recognized, resulting in literary fame. Over the latter half of the 18th through the mid-20th century, memoirists generally included those who were noted within their chosen profession. These authors wrote as a way to record and publish their own account of their public exploits. Authors included politicians or people in court society and were later joined by military leaders and businessmen. 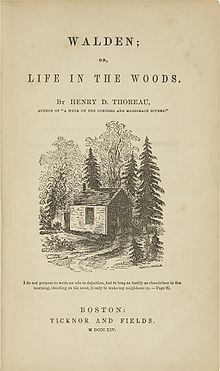 An exception to these models is Henry David Thoreau's 1854 memoir Walden, which presents his experiences over the course of two years in a cabin he built near Walden Pond. Twentieth-century war memoirs became a genre of their own, including, from the First World War, Ernst Jünger (Storm of Steel) and Frederic Manning's Her Privates We. Memoirs documenting incarceration by Nazi Germany during the war include Primo Levi's If This Is a Man, which covers his arrest as a member of the Italian Resistance Movement, followed by his life as a prisoner in Auschwitz; and Elie Wiesel's Night, which is based on his life prior to and during his time in the Auschwitz, Buna Werke, and Buchenwald concentration camps. In the early 1990s, memoirs written by ordinary people experienced a sudden upsurge, as an increasing number of people realized that their ancestors’ and their own stories were about to disappear, in part as a result of the opportunities and distractions of technological advances. At the same time, psychology and other research began to show that familiarity with genealogy helps people find their place in the world and that life review helps people come to terms with their own past. With the advent of inexpensive digital book production in the first decade of the 21st century, the genre exploded. Memoirs written as a way to pass down a personal legacy, rather than as a literary work of art or historical document, are emerging as a personal and family responsibility. The Association of Personal Historians formed in Amherst, Massachusetts, in the early days of the modern memoir, as an international trade association for professionals who assist individuals, families, and organizations in documenting their life stories, preferably in archival formats. With the expressed interest of preserving history through the eyes of those who lived it, some organizations  work with potential memoirists to bring their work to fruition. The Veterans History Project, for example, compiles the memoirs of those who have served in a branch of the United States Armed Forces – especially those who have seen active combat. ^ "memoir noun - Definition, pictures, pronunciation and usage notes". www.oxfordlearnersdictionaries.com. ^ "memoir". Merriam-Webster.com. Merriam-Webster. July 5, 2015. ^ (in French) Viennot, Éliane, Marguerite de Valois et l'écriture de l'histoire, 1574-1614, Études Épistémè, 17, spring 2010. ^ Saintsbury, George (1911). Saint-Simon, Louis de Rouvroy, Duc de, In Chisholm, Hugh. Encyclopædia Britannica, 24 (11th ed.). Cambridge University Press, pp. 47, 48. ^ Henke, Harold (2001). Electronic Books and ePublishing: A Practical Guide for Authors. Springer Science & Business Media. ISBN 978-1852334352. Retrieved 2014-12-12. ^ Balzer, Paula (2011). Writing & Selling Your Memoir: How to Craft Your Life Story So That Somebody Else Will Actually Want to Read It. Writer. ISBN 978-1599631356. Retrieved 2014-12-12. ^ Wright, Chris (2002-01-17). "Ordinary people". The Phoenix. Phoenix Media/Communications Group. ^ Time Magazine. "The Memoir Network". The Memoir Network. ^ "Veterans History Project (Library of Congress)". loc.gov.